Last week, I was surfing the net, and found this very interesting and educational videoclip about Zamzam Water that has gushed out from the ground since about 4000 years ago. And that is not the only miracle of Zamzam water, my dearest brothers and sisters. So, whatever the intention we make when we drink Zamzam water, that will be what we will get when we drink it. 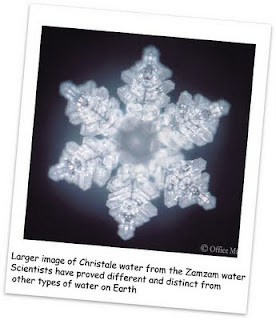 Now, that we know a little of what Zamzam water is, let us learn its history, inshaAllah. Here is the videoclip with you. Hope you liked it! From what I'd learned, the well was lost for about 300 years until Abdul Muttalib dug it. This is what I'd understand what had happened.